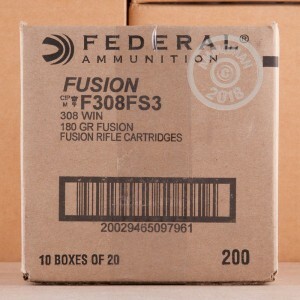 Recognizing a performance gap between economy priced and Premium rounds available for deer hunting, Federal came up with the Fusion bullet. 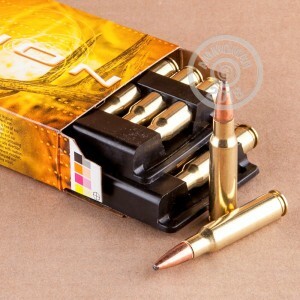 This bullet electrochemically bonds pure copper to a pressure formed core to insure optimal performance. The end result is a more economical choice round that generates high energy on impact, great penetration and lethal shock. 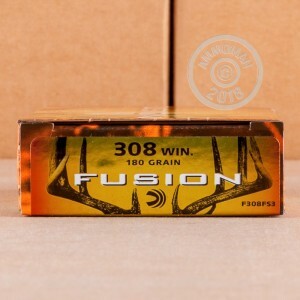 Whether you are chasing whitetails in the dense thickets of Alabama, or the wide open spaces of the Midwest, wherever you hunt, the Federal Fusion .308 Win. using the 180 grain Fusion bullet will get the job done. These rounds are Federal Premium quality brass, fully re-loadable and at 2600 fps they generate 2702 ft/lbs of energy at the muzzle. REMEMBER! Any order totaling over $99 has FREE SHIPPING from AmmoMan.com. Stock up for deer season today!